Here at Cheap-price.net we have Los Lonely Boys at a terrific price. The real time price may actually be cheaper- click on the 'Buy Now' above to check the realtime price of Los Lonely Boys at Amazon.com. California's Los Lobos are the reigning kings of Tex-Mex/Rock Espanol. But this debut CD by the San Angelo, Texas band Los Lonely Boys might herald a changing of the guard. This is truly a band of brothers, led by guitarist/vocalist Henry Garza and his younger, bass-and-drum-playing siblings Jojo and Ringo (no kidding). Like a lot of groups, they had to move away to achieve fame--in their case, to Nashville. But after the release of their EP, Willie Nelson heard them, put them on tour as his opening act, and recorded them at his studio--and the rest may be history. Stylistically, the Garza brothers' bilingual songs about love and life combine Stevie Ray Vaughan blues, Santana-style guitar licks and R&B. Nelson helps out on guitar, with Reese Wynans on keyboards. Produced by Keb Mo and B.B. King producer John Porter, the music is honest, driving, and down home, especially on the organ-filled uptempo tracks "Senorita" and "Tell My Why." The stinging guitar solo on the Afro-anthemic "Onda" recalls the '70s grooves Santana built his chops on, while "The Answer" and "More than Love" are raw power ballads that show off this group's dynamism and diversity. --Eugene Holley, Jr. In a word: excellent! This is one of those albums that you put in your cd player or computer (whatever the case may be) and just let it play straight through. No filler on this cd...just great music from beginning to end. Tex Mex, Texas Blues and Santanta all mixed together with great vocal melodies. I swear the guitar player is channeling Stevie Ray Vaughan's ghost. Not to say he is ripping off SVR just paying very tasteful tribute to him. Solid musicianship with songs that make you tap your foot. I dare you not to have "Heaven", "Crazy Dream" or "Real Emotions" stuck in your head after spinning this disc. Definitely going to wind up in my Top 5 for 2003! Highly recommended for listening while driving the car! Also check out the bonus CDRom footage which shows them playing live...can't wait to see it in the flesh myself. I have never, ever written a review on Amazon. But I am compelled to write about these 3 extremely talented brothers from San Antonio, Texas. This is their debut album. 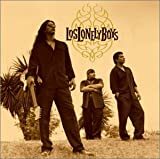 I have been reading about Los Lonely Boys for quite some time in the local papers here in Texas and was curious about the hype. Well, I am here to tell you that the hype is real. These guys are absolutely the real thing. Their sound is a little bit Santana, a little bit Los Lobos, a little Stevie Ray thrown in, and a whole lot of the Garza Brothers Rock and Roll. I have had this in my CD player since I bought it. They play very tight melodies, the song-writing and lyrics are real and heartfelt. All of the brothers sing and their harmonies are right on. Each song can stand on its own. And the bestg part is that you can actually hear the words and the wonderful melodies, as opposed to so many rock and roll bands that do nothing but blast away and play the same chords over and over again. Henry Garza's lead guitar playing is phenomenal. His fretboard work is exquisite, with little nuances spread throughout. Jo-Jo and Ringo Garza provide a rythmn section that enhances each song. I can't say enough about this ablbum. These guys deserve to hit it big and I think they will. DO YOURSELF A BIG FAVOR AND BUY THIS ALBUM. YOU WILL NOT REGRET IT! I had lost hope. A music lover, I bought on average one new album every week, wishing that it will be the One. I am hooked, my wife is hooked, my kids too. They are the best thing that happened to rock n'roll since...I can't even remember. I just hope that they will keep producing good music.